It’s been a while since a Volvo has shown up here, though they’re still one of the best deals going for classic canyon carvers. 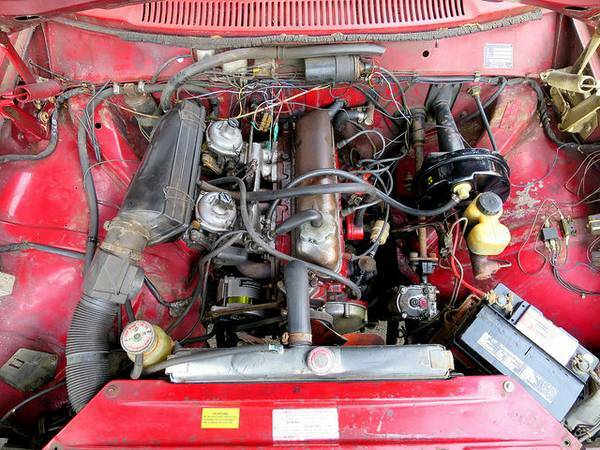 The boxy 140 and 240 series cars are iconic, can be made to handle quite well with some light modification, and are also pretty hard to kill. At this point, though, many of the older Volvos you see listed are either very high-mileage, or have suffered through the college years with the kids and been left to rot in the backyard. As it happens, the latter case is true for today’s car, but a kind Volvo-nut took it into foster care and did some rehab before sending it back out on the market. 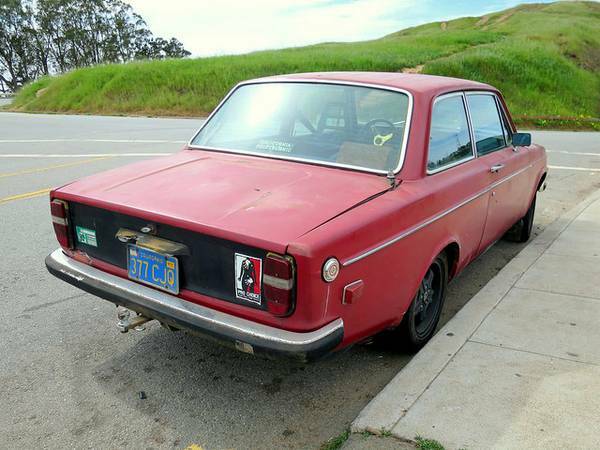 Check out this 1970 Volvo 142S for sale for $3200 in San Francisco, CA. The seller has done a substantial amount of debugging after the car’s 10-ish years of storage. Compression numbers are given, and the car has performed well in the hills of San Francisco and on the local highways (which of those is the tougher test is a good question). Interesting features on the car include some European features said to indicate a German market car, along with parts installed for autocross duty, including a 4-to-1 exhaust header, IPD anti-roll bars and heavy duty shock absorbers. Famous for its straight-line design, this car’s previous owners apparently thought some curves would improve the design. So while it’s largely straight, the trunk lid looks a little warped, the front and rear bumpers are bent, and it’s had body work done to the front and rear of the car, which should explain the flaking paint on the left rear fender. Other improvements include a black tail panel, clearly meant to evoke historic racing cars such as the Alfa Romeo Giulia TZ. 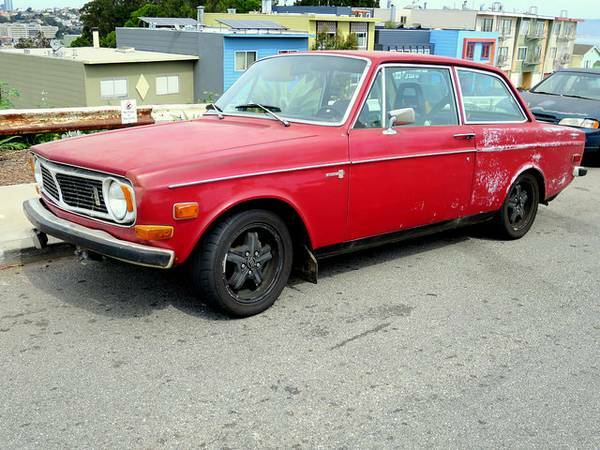 The seats were rough when the seller picked the car up, so seats from a 1975 Volvo 242 were installed, though the originals come with the car. While Volvo OEM seats are among the most comfortable in the world, it would be fun to install a couple of period sports seats in the front, in keeping with the autocross modifications. 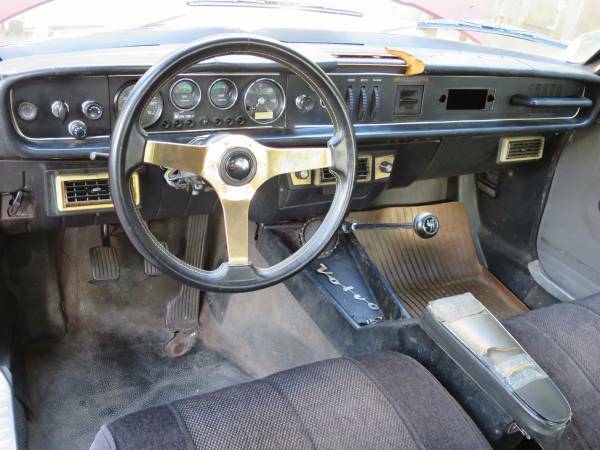 Other interior features include period dealer A/C controls, newer seat belts, and an aftermarket steering wheel. Most interesting is the R-sport 4-gaugle cluster in place of the stock ribbon speedometer. The car benefits from much maintenance catch-up work, including new hoses, thermostat, radiator, water pump, gas tank, brake calipers, flexible lines, and higher output alternator. With the car running so strongly, it would be fun to focus on the engine’s performance – you’d probably do well focusing on the items the seller suggests, such as bushings, suspension, and exhaust, but add upgrades to carburetors and cams for a fun canyon carver that will hold its own with some of the quicker cars out there. This entry was posted on June 1, 2015 at 11:51 am and is filed under Feature. You can follow any responses to this entry through the RSS 2.0 feed. You can leave a response, or trackback from your own site. A 143GT at this price, i would say yes.